Hello and welcome to exampundit. 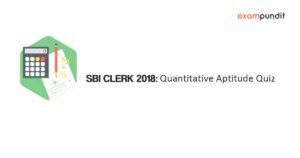 Here is a set of Quantitative Aptitude Quiz on Simple & Compound Interest based problems with Shortcut Solutions for Prelims exam of SBI Clerk 2018. 1. Virat invested a sum of money at a certain rate of simple interest for a period of 4 yrs. Had he invested the same sum for a period of 6 yrs the total interest earned by him would have been 50 % more than the earlier interest amount. What was the rate of interest percent per annum? Explanation: Principal and rate of interest both are unknown. Information is incomplete. So ans should be can’t be determined. 2. Rs. 600 becomes Rs. 720 in 4 years when the interest is simple. If the rate of interest is increased by 2%, then what will be total amount? 3. Akshay invests Rs. 1 lakhs at 12% p.a. for 1 yr. If he invests Rs. 500 more, he is eligible for 13% p.a. interest. How much more interest would he receive, if he accepted the second option? 4. A certain sum of money amounts to Rs. 756 in 2 yrs and to Rs. 873 in 3.5 yrs. Find the rate of interest. 5. Divide Rs. 4758 into three parts so that their amounts after 2, 3, and 4 yrs respectively may be equal, the rate of interest being 5% per annum. Find amount of 1st part. 6. If the difference between the simple interest and compound interest earned on an amount @ 15 p.c.p.a. at the end of 3 yrs is Rs. 595.35, what is the amount? 7. In the year 2016, 5000 students were admitted in a college. It is found that the number of students admitted is constantly increasing by 24% per year. How many students will be admitted in the college in the year 2018? 8. If the difference between simple interest and compound interest earned on a sum of money at the rate of 5% per yr for 2 yrs is Rs. 16, find the principal. 9. A sum of money at compound interest amounts to thrice itself in 3 yrs. In how many years will it be 9 times itself? In 6 yrs amount will be 9 times. 10. The compound interest on a certain sum of money for 2 yrs at 10% per annum is rs. 420. Find the simple interest at the same rate and for the same time. Next articleHow to prepare for SBI Clerk exam without coaching?